Thanks to its southwesterly aspect, Cinquefoil Mountain makes for an enjoyable early season climb that offers great views of the Athabasca River Valley, Jasper, Talbot and Edna lakes, the Miette and Colin Ranges (including Roche Miette, Utopia Mountain, Mount Colin, Hawk Mountain and Morro Peak), and ends rather dramatically at the foot of a soaring sub-peak of Roche Jacques. I climbed Cinquefoil Mountain under near perfect springtime weather with my friend Vicki. 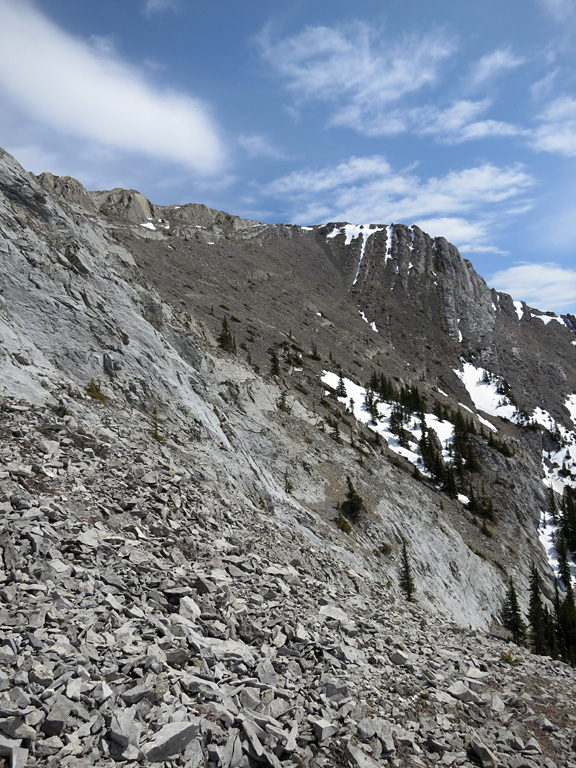 Cinquefoil Mountain is easily found 22km northeast of the Town of Jasper along the south side of the Yellowhead (Hwy 16), just before reaching Edna Lake. The traditional trailhead for accessing Cinquefoil is unsigned and consists of a vehicle pull-out with a pair of bear-proof garbage bins. The trail here leads a few hundred metres southeast to a small lake, from which you'll head to your left (east) to eventually gain the obvious ascent ridge. However, there is a shortcut available. Based on a tip from some fellow scramblers, we parked further east along the highway near the point where the ascent ridge comes closest to the road, just before the start of Edna lake. From here the ridge is only about 60m away, but it does require a short leap over a ditch and an interesting bushwhack through a marshy bit of forest. When Vicki and I passed through, it was fairly dry and the underbrush was just budding. So we made it through fairly quickly. Later in the year when the underbrush has grown in, or during wet periods, this shortcut may not be worth the bother. Regardless, you'll know how passable this shortcut is within the first few metres of entering the forest, so it may be worth at least testing at any time. Worst case scenario is that you'll need to retrace those few steps and then drive back to the traditional trailhead. Once you've gained the ascent ridge by one route or another, the next several hundred metres of the climb are very easy to follow, as there's a well-defined trail and, at times, an absurd number of cairns (often only a few metres apart). Mid-way up you'll encounter a bit of a mystery: a section of forested trail where a few dozen trees have been cut-down to form a clear, 3m wide path. Looking at the remaining stumps, and the route the well-trodden path weaves through them, it's not clear how these removed trees would have interfered with the path in the first place. A further mystery is that this bit of “maintenance” hasn't been performed anywhere else along the ascent route. The false summit area of the mountain (roughly 3/4s of the way up in this photo) is where you will need to make an important decision on which route you want to take. Kane's scramble route heads straight up and over the false summit, whereas an alternative route traverses far over to the right and up a scree gully (the snowy, treed area to the right of the false summit in that photo, also seen here). From that point, the alternative route requires a quick traverse, and then another scree slog back up to the ridge behind the false summit (seen here). Vicki and I followed the easier route up and then the scramble route down, and the key advantage of the scramble route is that it's much faster. Saving as much as 20-30 minutes in each direction. However, it's also very steep (the camera was held at a 45° angle to take this photo, which downplays how steep it is), and very exposed to the east (climber's left) — although that exposure can be avoided for the most part. There are some decent chimneys to climb, but you may need to really stretch for some holds in spots. 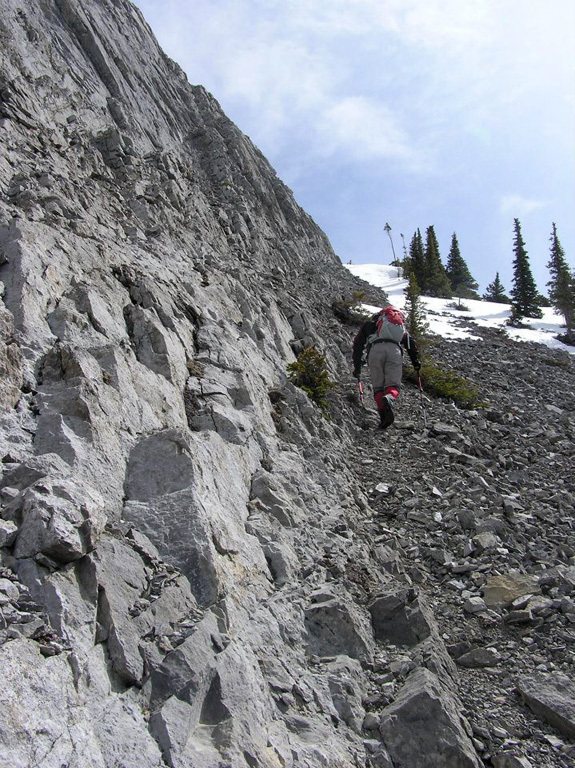 If following the easier scree route, my advice would be to stick close to the slabs and make use of them whenever you can to accelerate your upward progress. 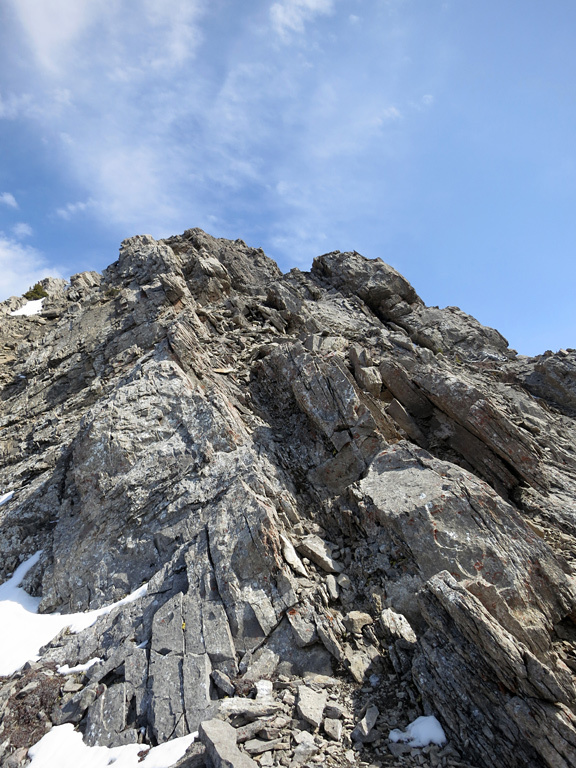 The rest of the ascent is an easy and enjoyable hike once you've gained the ridge beyond the false summit. Enjoy the views, take a break, and then commence the long descent back to the highway to complete another eventful outing in the Rockies. Remember the sunscreen. The entire ascent is fairly unsheltered against gusting winds, and windburn can easily occur to any exposed areas. 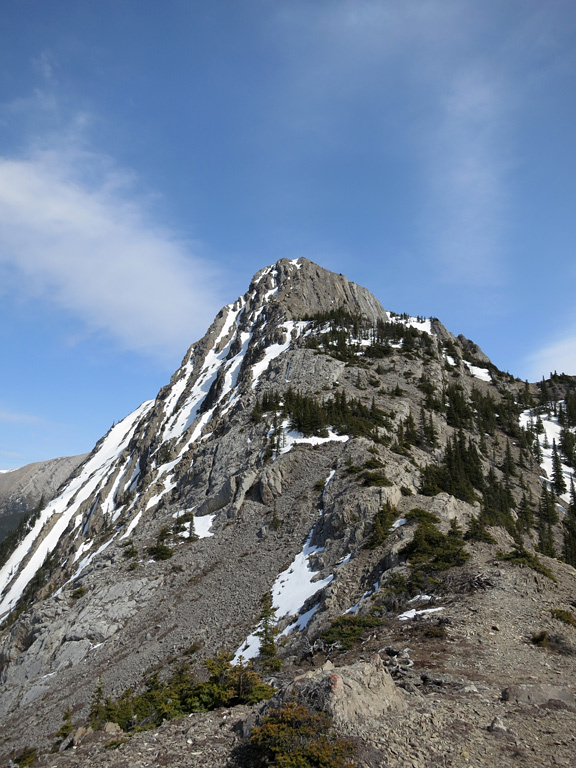 The ascent of Cinquefoil Mountain is also described at length in Alan Kane's book, Scrambles in the Canadian Rockies. 2,257 m / 7,405 ft.
996 m / 3,268 ft.
1,261 m / 4,137 ft.
34 m / 112 ft.